(1) When the electrical key transmitter sub-assembly is in a detection area inside the vehicle and the brake pedal is depressed, the engine is started by pressing the engine switch. (2) When the electrical key transmitter sub-assembly is in a detection area inside the vehicle and the brake pedal is not depressed, the power source mode is changed by pressing the engine switch. The power source mode changes in the following order every time the engine switch is pressed: off → on (ACC) → on (IG) → off. 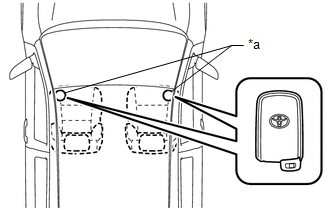 (3) After getting into the vehicle while carrying the electrical key transmitter sub-assembly when the engine switch is off, if the engine switch is pressed while not depressing the brake pedal, the power source mode changes to on (ACC) and "ACCESSORY" is displayed on the multi-information display. 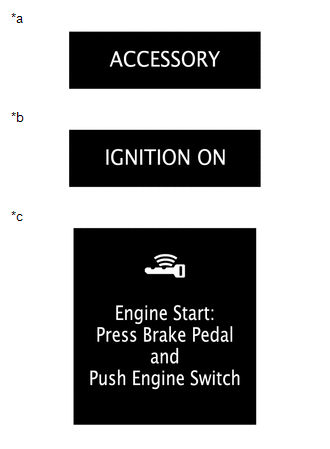 (4) After getting into the vehicle while carrying the electrical key transmitter sub-assembly when the engine switch is off, if the engine switch is pressed 2 times without depressing the brake pedal, the power source mode changes to on (IG) and "IGNITION ON" is displayed on the multi-information display. (5) After getting into the vehicle while carrying the electrical key transmitter sub-assembly when the engine switch is off, if the brake pedal is depressed while the shift lever is in P, the entry warning light is displayed on the multi-information display. (6) The engine will start if the engine switch is pressed when the entry warning light is displayed. (1) Unlock the door using the built-in mechanical key and get into the vehicle while carrying the electrical key transmitter sub-assembly. (2) While depressing the brake pedal and facing the logo side of the electrical key transmitter subassembly towards the engine switch, hold the electrical key transmitter sub-assembly near the engine switch. 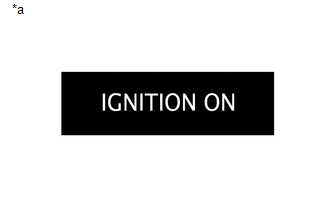 (3) A buzzer in the combination meter assembly will sound and the power source mode changes to on (IG) and "IGNITION ON" is displayed on the multi-information display. (4) Pressing the engine switch without depressing the brake pedal turns the power source mode from on (IG) to off. (2) While depressing the brake pedal with the shift lever in P and facing the logo side of the electrical key transmitter sub-assembly towards the engine switch, hold the electrical key transmitter sub-assembly near the engine switch. (3) A buzzer in the combination meter assembly will sound, the power source mode changes to on (IG) and the entry warning light will be displayed on the multi-information display. 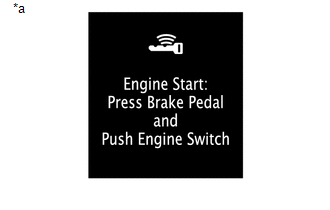 (4) Press the engine switch with the brake pedal depressed to start the engine. (1) Get into the vehicle while carrying the electrical key transmitter sub-assembly with the engine switch off. With the shift lever in P, check that the entry warning light is displayed when the brake pedal is depressed. Check that the engine starts when the engine switch is pressed after the entry warning light is displayed on the multi-information display. (2) While the brake pedal is released and the electrical key transmitter sub-assembly is being carried, check that the power source mode changes in the following order when the engine switch is pressed: off → on (ACC) → on (IG) → off. When the engine switch is pressed with the engine switch on (IG) and the shift lever not in P, the power source mode does not change to off, but changes to on (ACC). (3) With the shift lever in P, check that the steering lock operates when a door is opened. When the engine switch is pressed after the vehicle is stopped, the engine stops and all the power turns off. However, if the shift lever is not in P when the engine switch is pressed with the vehicle stopped, the power source mode does not change to off, but changes to on (ACC). (4) Check the push-button start function operation range for the front side. Place the electrical key transmitter sub-assembly at either inspection point so that it is facing the direction shown in the illustration, and then check that the engine can be started. Even if the electrical key transmitter subassembly is in a vehicle interior key detection area, the electrical key transmitter subassembly may not be properly detected if the electrical key transmitter sub-assembly is on the instrument panel, in the glove box or on the floor. 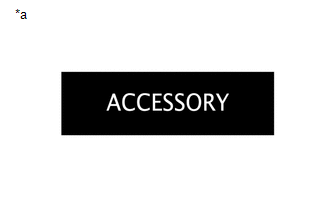 Communication may not be possible if the electrical key transmitter subassembly is within 0.2 m (0.656 ft.) of the center of the rear seat. Perform this inspection for both inspection points. (5) Check the push-button start function operation range for the rear side. Place the electrical key transmitter sub-assembly at either inspection point so that it is facing the direction shown in the illustration, and then check that the engine can be started. (1) Press the unlock switch of the electrical key transmitter sub-assembly twice while pressing the lock switch and check that the electrical key transmitter sub-assembly LED blinks 4 times and enters transmitter battery saving mode. (2) Check that the smart key system does not operate while in transmitter battery saving mode. To cancel transmitter battery saving mode, press a switch of the electrical key transmitter subassembly. (a) Check the engine switch. (1) Check that the power source mode changes according to the chart below. *1: This situation is only applicable when the power source mode has changed from on (IG) to on (ACC) (Excludes an emergency stop by pressing the engine switch 3 times quickly or pressing and holding the engine switch for 2 seconds or more). *2: This situation is only applicable when the steering is unlocked. (a) Check the entry warning light. The power source mode was turned from on (IG) to on (ACC). Key verification is OK*2 or immobiliser is unset (engine switch is on (ACC) or on (IG)). The shift lever is in N and the steering is unlocked. The stop light switch is on. The power source mode was not turned from on (IG) to on (ACC). The shift lever is in P, or the shift lever is in N with the steering unlocked. 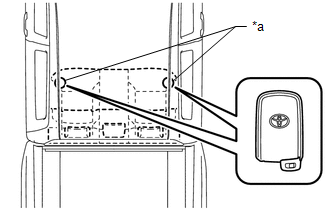 *2: When the electrical key transmitter sub-assembly is in the cabin, the ID code sent as a result of communication between the electrical key transmitter sub-assembly and certification ECU (smart key ECU assembly) and the ID code calculated by the certification ECU (smart key ECU assembly) are compared. If the ID codes match each other, the vehicle recognizes that the electrical key transmitter sub-assembly is in the cabin.